Mainliner is designed to handle the oily mists used to lubricate pneumatic tools. This hose is an excellent choice for use with pneumatic tools throughout the industry. It features a medium oil-resistant tube with multi-spiral polyester reinforcement that keeps it flexible even in extreme temperatures. The durable cover resists abrasion, cracking, weathering and ozone. Mainliner offers constant working pressures of 250 and 300 psi. 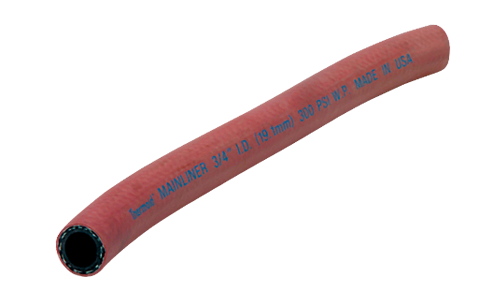 Mainliner is the quality value choice for a general service hose for oily, pneumatic equipment lubrication. Not recommended for handling fuels.